Trips to the mailbox have been very rewarding this week. The beads for Bitterroot showed up, and I have already been working with them, although they are very difficult to see in this photo. With only twenty-five rows remaining, I have answers about the yarndage. Yeah, I am going to need to spin some more yarn for this shawl, but I view that as more good news. Speaking of beads, look what Our Opal sent to me. This is such a cute book, with so many different patterns. We have both been noticing how many books we have that we are yet to create from yet. Still, there's always tomorrow, and the inspiration for today, right? Did you know that Opal has a new place? Remember to update your bookmarks and feedreaders accordingly. To celebrate the move, she is having an excellent contest you will want to enter. Speaking of winning contests, well, that will have to wait for another day. Yo, Dough, and Double Doh! I made yogurt, and that was pretty much the coolest thing I have done this month. I know that I made it more work than it needed to be, and that next time will be easier and better. I am perhaps more excited about this than I should be, but I like yogurt. I tried a new-to-me method of making bread. I had a free booklet with a few recipes from Kneadlessly Simple by Nancy Baggett. It was fine, but perhaps needs more exploration and experimentation. This is one of those long, cool rise methods. I started on a Saturday and was baking the dough on Monday. 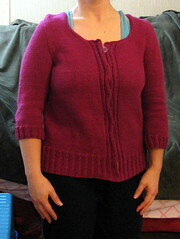 I finished knitting the Golden Vintage Cardigan. There really was not much left, and it did not take long. It is so cute, but it does not fit me. I kind of want to take my scissors to it and then burn it. This is how it looks right now. Note that I used tape to close the front, as sewing on buttons right now would be even more ridiculous. As far as I can tell, the problem, like others of mine, is in the armpits. It is really quite horrible. I know that the trouble must be with me, as others have knit this cardigan and had it fit nicely. I have a few ideas of what I will do with this. One of them would be to undo the seaming, rip back some, and fix it. However, I think that if I take the time to pick it back apart, I will not be fixing the sweater, but rather, I will be ripping, re-skeining, washing, and returning the yarn to stash. The Bitterroot Shawl is coming along nicely. I have reached the first row of the beads, but they are not yet here. I think they should arrive early this week, but I am not too concerned. What does concern me is how light my remaining cake of yarn feels, so I weighed it. 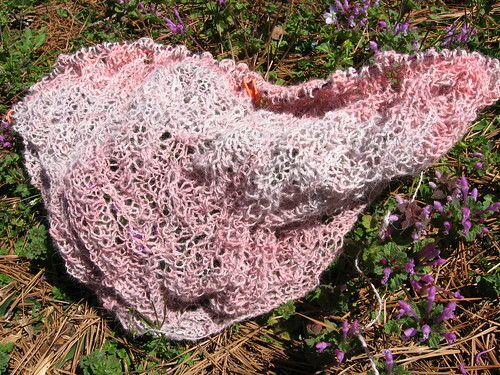 The next step was a quick check in with the Shawl Progress Calculator (it's in the sidebar). Yeah, so those numbers gave me useful information, but not the answers I hoped to find. At least I have more of the fiber, and a reason to get spinning right now. I Might Need to Borrow a Stronger Cup of, "No." Actually, I just need to be alright with having said that I will not be able to do something for someone, and let the other person be responsible for understanding that my saying, "No, I will not be able to do that. I'm sorry; I cannot take on that commitment," means just that. Having someone disregard that threw me for a bit of a loop. When the phone rang Monday morning, I learned that someone out in the family is having a new baby this year, and that the great-grandmother would like me to knit a blanket for the occasion. Twice in the past, I have knit baby blankets on her behalf. Once again, she ordered the kit, and then asked me to knit. I feel a little bit bad about turning her down, but I think that this is the right decision for me. After I had told her that I would not be knitting the blanket, I went on to explain that I am very busy right now and briefly touched on some other things going on in our life. I thought I had been polite and firm, and as we were wrapping up the conversation, her response caught me completely off-guard. She told me that I could just stop by her place and pick up the thread (her word for yarn). I am quite sure that she ignored me turning her down again as I hurried off the phone. I could hardly believe it. I was glad to have the garden to work in after that exchange. That applies to so many things, but we will start with the knitting. There is a sock on the needles, and it is growing. Skew has been keeping Bitterroot and me company. So far, I like the pattern, and how the sock is fitting my foot. 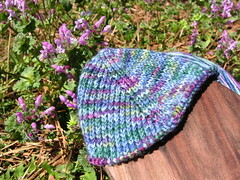 Of course, I have not yet reached the heel and its "origami moment," so I may feel differently later. Being able to knit a round or two on the sock is nice for the times I want to knit, but do not have the time for Bitterroot, and the past few days have had plenty of moments for both projects. On Friday, the plan was to meet family for lunch and then go to the hospital. We did that, but not in the way we expected. While we stood in line at Jason's Deli, Bruce began to feel unwell, uncomfortable, and then in terrible pain, and then was in an ambulance. We spent the rest of the day in the ER, and then Bruce got to take another ambulance ride to the Birmingham VA. The first concern was his heart, but it was his gall bladder that was the trouble. It was a bit of a rough weekend, and it felt very long, but hearing Katie tell us, "Happy Easter," over the phone made all the difference. We still have a long way to go. Today, Katie went to rehab in Birmingham, and then has outpatient therapy to follow, but she has already made so much progress. Bruce has to have his gall bladder removed next week. There is so much to do, so many people to help, some real concerns that are out of my control, and it can feel overwhelming. Putting my name in the list of people I need to take care of is one step I have taken, and I am going to make my way through this. I know I have a wonderful group of friends and some great family members who will help me if I will just let them. Thank you, again, everyone, for all of your prayers, thoughts, love, and support. Taking Opal's suggestion, I am knitting Bitterroot with my alpaca yarn. I calculated yardage two more times to be sure before I began. It actually took me a few days to get started, but am already nearly finished with the second chart. At this point, it really does not look too lovely, but I stretched out a section to get a bit of a blocking preview, and I think this might be a winner. Even if it is not, fear of the frog is not here. I am glad to have this lace on the needles now. It is nice, simple, and almost mindless. I can keep knitting along without paying much attention at all. I consulted Dr. Google for a bit of information, as it would seem that nearly everything I have learned about comas from soap operas, movies, and other television programming is wildly inaccurate. Who knew? Anyway, I gained a better understanding of some things, but the brain is still something of a mystery, and we are all trying to not get ahead of ourselves. Katie is still comatose, but she does open her eyes sometimes. We like to think that she is looking at us and seeing us. The type of brain injury she sustained is serious; however, the degree of injury is not yet known. Passing the 72-hour mark was an important milestone, and they will re-assess again next week, around 10-14 days past the accident. Thank you, everyone, for your thoughts and prayers for Katie and the rest of our family. If you want to follow her progress, my brother is posting updates here.